A few years ago I went to the Christmas Eve Mass and the priest was an old retired priest who seemed to ramble or maybe I was too tired to follow him. Nevertheless, one word struck me and has stuck with me: the word was awe. 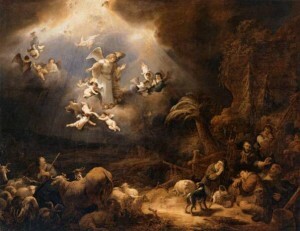 Can you imagine the awe the shepherds felt? An angel appeared to them to tell them that a Savior was born! Then the sky was filled with angels singing! They went to see a newborn baby and – in awe — believed that this baby would save Israel. They went and saw a poor carpenter with his young wife who gave birth in a stable and – in awe – they did homage to the newborn King. Jesus certainly didn’t look like a king lying in a manger, yet they were in awe. They saw beyond the appearances and believed. This Christmas and everyday we get to see the same Jesus when we go to Mass. Every day, Jesus, the Son of God, the second person of the Holy Trinity appears at Mass and is worshiped by the angels. If we look beyond the appearances and believe, we get to be in the presence of God. The shepherds didn’t know Jesus was God. We do. Or we should! Shouldn’t we be filled with awe at this great privilege? We get to approach and talk to Almighty God. He wants to dwell in our hearts. Almighty God wants to dwell intimately in my heart and yours. Angels can’t receive Him in communion but we can. How different things would be if we truly understood the awesomeness of the Eucharist? We get to be intimate with God. We get to hold Him in our hands, to touch Him and to consume Him. We get to tell Him about our joys and sorrows, our dreams and concerns. We get to bring Him ourselves as a gift and offer Him our lives. We are closer to Jesus than the shepherds were; even closer thanSt. Johnwho rested his head on the chest of Jesus at the Last Supper. All because He loves us! On Christmas Eve I thought back to the Old Testament days and how the Hebrews worshipped in theTemple. Only a priest could enter the Holy of Holies. The people were separated by the curtain. Even the priest had to be purified and went in awestruck, often fearful of dying. It was no simple thing to approach Almighty God. Only a few were able to talk to God in the Old Testament, prophets like Moses and Elijah. How different is it for us today! Even seven year olds can approach Jesus and receive. What a privilege! Maybe we should take lessons from First Communicants. Many seem more devout and awestruck than the adults who received. As we grow up we tend to take Communion for granted, forgetting what an awesome gift we receive. Unfortunately, receiving Communion gets routine and we focus on other things and distractions. In a way it seems like Catch 22. The more we are distracted, the less graces we receive, the less aware we are of the privilege we have and the more likely we are to be distracted in the future. It seems like a never ending cycle. Somehow we need to get back to the sense of awe we once had, to focus again on the awesomeness of receiving Almighty God in Communion. The question is how. How have other people done this? Many people have had their faith completely stirred by going on a pilgrimage. For some reason it is easier for us to believe at a place where we are away from the distractions of people we know. Maybe it is because of the devotion of many of the people who surround us at these sites. People aren’t there because they have to fulfill their Sunday obligation but because they want to be. What if we can’t go on a pilgrimage? We have to find a way to awaken in ourselves the sense of awe. The same Jesus in the tabernacle at these holy sites is in our local tabernacles. Perhaps we need to start by prayer asking God to give us the sense of awe that He wants us to have. Probably the best place to pray for this is in front of Jesus in the tabernacle or exposed at Adoration. Arrive early enough to pray before Mass, asking Mary and the Holy Spirit to help you to be as prepared as you could be, to help you focus on what the Spirit wants you to learn at Mass and to help you focus on Jesus. Ask Mary to help you to pray, especially after Communion. Make it an awesome Christmas! Ron Quinlan is a former teacher in the Archdiocese of Newark, now living in South Carolina. All Saints Day — Because We Were Created for Something Better!